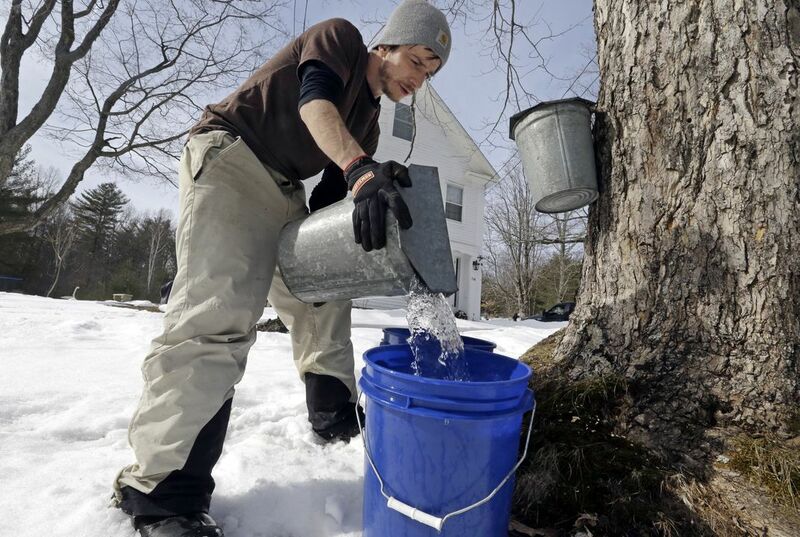 New Hampshire's maple syrup producers say they are feeling the impact of climate change. Winters have become warmer. The frigid nights that are so critical to their business have become fewer. Producers joined climate experts and Democratic U.S. Sen. Maggie Hassan of New Hampshire to talk about the state's changing climate and how it is affecting one of the state's most important industries. Some producers talked of seeing a steep drop in the amounts of sap they are getting. Others are dealing with another trend attributed to warmer temperatures. It is where the sap goes up to the top of the trees rather than down to taps. Others complained about a drop in the sugar content of their sap. "When I purchased the farm in 2000, "I was getting 75 gallons of sap," said Ray LaRoche of LaRoche Farm in Durham. "With the environmental changes we've been seeing, it's down to 15 gallons. That's a dramatic loss for us. And I don't know what to do about it." Connecticut, Maine, Massachusetts, New Hampshire, New York, Pennsylvania and Vermont produced 3.78 million gallons of syrup in 2016. That is according to a Northeast maple syrup production statistics service run by the U.S. Department of Agriculture. Vermont is the clear leader. The state produced more than 47 percent of the country's maple syrup. Sen. Hassan said the state's changing climate can have dramatic effects on the natural resources that "define us as a state and are critical to our economy, our environment, and our way of life in New Hampshire." "Unfortunately, we are already seeing the real impacts of climate change on our economy - including on our maple syrup and ski industries," she said, referring to warmer winters and a decline in snow cover. The ideal temperatures for sap production are in the 20s at night and 30s and 40s during the day. When the climate is in the 50s and 60s during the day and the nights stay warm, sap runs not down to the taps, but to the tops of the trees. It causes the tree to bloom. That can lead to a cloudy and off-tasting product. "The other day we had a nice 50-degree day which is kind of the new normal but still not normal," said Jeff Moore of Windswept farm. "One of the challenges we've had to start weighing is when do we actually tap because putting a tap into a tree is a wound, the trees naturally act to try to compartmentalize that wound and wall it off." The longer the tap has been exposed to the environment, the sooner the tree is going to wall it off, Moore said. 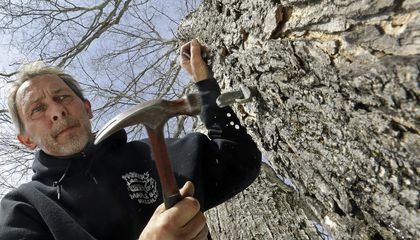 "When I was growing up," he added, "you didn't want to tap too early, because if you tapped too early you'd miss all of the good weather at the end of the season, when most of your sap is running. So that gets a little more challenging now." But despite the challenges, some producers and experts at the University of New Hampshire say technological fixes are helping the industry adapt - and even extend the season. "Climate change is man-made. And that's the good news," said Cameron Wake, who leads a research program at the University of New Hampshire that's investigating regional climate change. "Because if we caused the problem, we can fix the problem." Why can't growers compensate for change in climate? Growers can't compensate for change in climate because when the weather is warm the sap will go to the top of the tree rather than going down like its supposed to. The producers can't do much about how much sap they get from the trees, because the warm weather is causing the trees to bloom instead of go down the taps. The syrup makers can't control the weather, so they can't make up what ever they were supposed to get. Growers can't compensate because of global warming,caused by polution which makes the air hotter. They cannot stop the climate change because the sap causes the tree to bloom or grow and when it is cold it goes down so they can get it. Because when its warm the sap goes to the top of the tree rather than the bottom, and the sap doesnt have as much sugar content in it. Growers cannot compensate for climate change because it is always changing and there is nothing anyone can do about it. Growers can't compensate for change in climate due to the warm weather which allows the trees to bloom instead of going down to the taps. Growers can't compensate for the change in climate because they cannot control the weather and the fact that the sap won't go where it is needed. This change has happened so fast, that it is hard for them to recover or fix it. Growers can't compensate for the change in climate because the other organisms involved like the producers and consumers are having trouble getting sap from trees because of the late bloom due to the cold wintry weather. Growers were also not prepared for the weather to be this cold for so long. Climate change isn't something that humans can change which makes it impossible for the growers to make it cooler to get the syrup.Also the cold climate is specifically what is needed to get enough syrup.